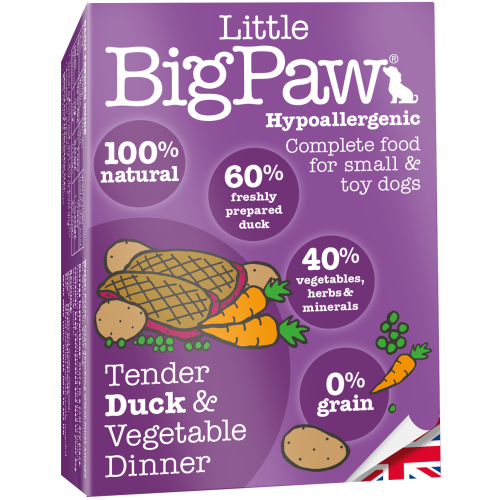 Little Big Paw Tender Duck & Vegetable Dinner is a nutritionally balanced wet food for small dogs. 100% natural it is bursting with tender meat! It’s high in energy, nutrient dense and rich in calories. Ideal for little dogs who have large energy requirements, faster metabolisms and who burn energy faster than larger dogs. •	The fresh duck meat is highly nutritious, packed with protein, its easily digestible and low in fat. •	Full of natural carbohydrates such as potatoes, green peas and carrots for optimum energy and healthy digestion. •	Contains vitamins A, D, E & B complex for a healthy immune system and strong teeth and bones. •	Rich in essential fatty acids for healthy skin and coat. •	Free from artificial preservatives, colourants, flavourings, grain, wheat, soya and dairy! Dog weight, up to 3kg: On it's own - 2 trays, with a high quality dried food - 1/2 tray. Dog weight, up to 5kg: On it's own - 3 trays, with a high quality dried food - 1-1/2 trays. Dog weight, up to 10kg: On it's own - 4 trays, with a high quality dried food - 2 1/2 trays.